This has always been one of my favorite films. Apparently it's supposed to be a guilty pleasure. I can't imagine why though. It's not a deep or socially important work of art, but it doesn't pretend to be. It's just a glorious, old-fashioned piece of entertainment, gorgeously shot on location in Germany, with one of the best scores the late Michael Kamen ever wrote. Alright, so Melanie Griffith convinces Michael Douglas to send her as a spy into Nazi Germany because of her phenomenal streudel baking skills. It's that kind of movie. Either you let yourself be swept away by the storytelling, or it's just not for you. The big news, however, is that this great movie is finally on DVD in the US. And it's in widescreen, a vital piece of information that was left off the listing here. I was really afraid I'd walk into Tower today and see a Pan and Scan atrocity and have to leave it there unbought. Worry not, the film is presented here as it was in theaters in 1992. The makers of this DVD have also kindly left the original burned-in subtitles for the sequences in German, instead of replacing them with those ugly player generated ones you see so often. I always liked the font the filmmakers chose, so this was a pleasant surprise. It would have been nice to have a director's commentary, or some of the approximately half an hour that was removed from the version that was shot. However for under $10 what we get (two trailers) is fine. One of the worst movies in years! THIS IS A CLASSIC - A WAR TIME ROMANCE! The movie begins with Mrs. Ed Leland being interviewed by the BBC for their series of war stories. Being a half Jewish girl, half Irish & half German, she, Linda Voss wants desperately to save her cousins in Germany, especially Sophia who plays the flute. Her life changes when she happens to stumble into a secretary's job for a lawyer, Ed Leland. Because of her love for war movies, she pegs Leland as a spy. He is very private, stoic and withdrawn. In proving an interpretor as being a possible double-spy she becomes privy to some of the inner goings on of Ed's office. She does finally cause him to smile and they do fall for each other and become lovers. Their relationship suffers a seperation after Pearl Harbor and Ed disappears for several months. During the War she is relagated to the secretarial pool in the basement where she is always searching some word of Ed. He never contacts her. She spends some time at the USO and in walks Ed Leland with a brunette on his arm. He doesn't see Linda until he starts dancing and then all hell breaks out emotionally. She begs him to tell her how to quit loving him. Watch it to find out how she convinces the powers that be to send her to Germany as a spy. Boy does she goof up. There she meets up with Sunshine, Margrete Von Eberstein and Horst Drescher. Drescher sets Linda up [in hiring her to cook]to meet Franz-Otto Dietrich and his two children. Linda then disappears from all aquaintances [and scares the crap out of Ed] as she takes over the job of nanny to the high ranked German. Even Margrete does not know where she is. Linda pursues her quest for her cousins. And tells Margrete and Ed [when he shows up undercover]that she has located her cousins. During a bombing raid she has Dietrich's children with her as she locates the address of her cousins [only to find them gone] and learns of a hidden room in Dietrich's basement. She has film and Ed is waiting to help her make an escape from war torn Germany. You have to see her flight and Ed's daring rescue of her and the other twists and actions to fully enjoy this love story. Do not pass it up - see for yourself just how good it really is. I love Shining Through, and 13 years later, it still holds up as a sweeping romantic thriller, and one of Melanie Griffith's last great roles on film. It's hard to believe this film won the Razzie for Worst Film and Worst Actress in 1992, when there were several bad films that year (co-star Michael Douglas also starred in the awful Basic Instinct, which was much more deserving of a Razzie). But I would ignore the negative criticisms of the film and seek out this underrated gem, finally out on DVD. It looks stunning, and I credit Fox for giving us an excellent transfer. The widescreen looks fabulous and for $10, this is no cheap pan-and-scan write-off. This is a chick flick through and through. We're talking 100% female fantasy. It is similar to the 2001 film "Charlotte Gray," which starred Cate Blachett, but where I found that film a bit flat, it was nowhere near as implausible, silly, and just plain bad as this film. "Shining Through" is also in the same genre as 1979's "Hanover Street" starring Harrison Ford, Lesley-Anne Down and Christopher Plummer, but I actually liked Hanover Street, despite the fact that it, too, was a bit of chick flick. Cannot even compare to the book! A wonderful story. 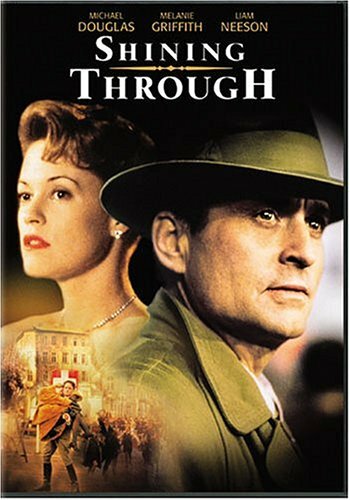 Michael Douglas made me fall in love with his character, and this is Melanie Griffith's finest performance, in my opinion. In fact, this is one of my favorite movies. Bah to the negative reviews and people who want to sound oh so knowledgeable. Get a grip, and just relax and enjoy the movie.